“Natural events such as the collision of hail or rain with hard surfaces, or the song of cicadas in a summer field…these sonic events are made out of thousands of isolated sounds; this multitude of sounds, seen as a totality, is a new sonic event. This mass event is articulated and forms a plastic mold of time”. That quote from Xenakis was used by support act Rogers and Jones to illustrate the ambitions of their piece, a musing on the relationship between our perceptions of time and sound; however it seems much more apt in the context of Oval’s recent work. Markus Popp’s O album was a veritable barrage of tiny sounds, all individually clipped and cleaved from context, scattered like rain from seeded clouds. The pristine precision of this new sound, or sounds, showed a huge progression from his equally innovative smudged glitch; this gig was to show that he’d applied some thought to changing how we perceive the Popp live performance. Popp’s Thrill Jockey label mate Alexander Tucker appeared before him as Imbogodom. A different beast to his usual guitar and cello loop creations, the Imbogodom album was made with Daniel Beban, a New Zealander who worked for the BBC’s World Service. Given their respective backgrounds, the resulting album neatly knitted Tucker’s dark drones into a Radiophonic framework, using tape loops and effects. 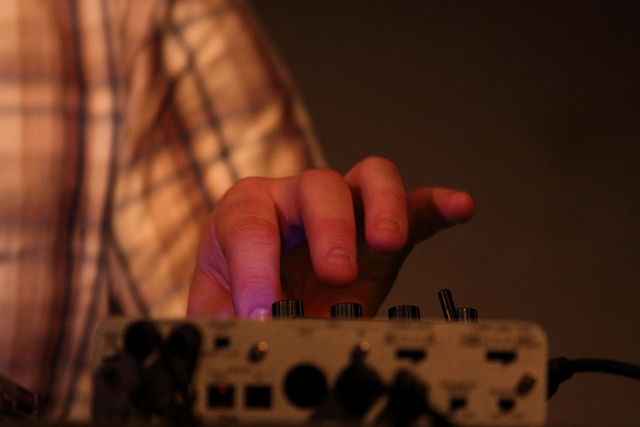 Tucker attempted to recreate that sound here on stage using samples of the recordings and a battery of pedals. Clever stuff. 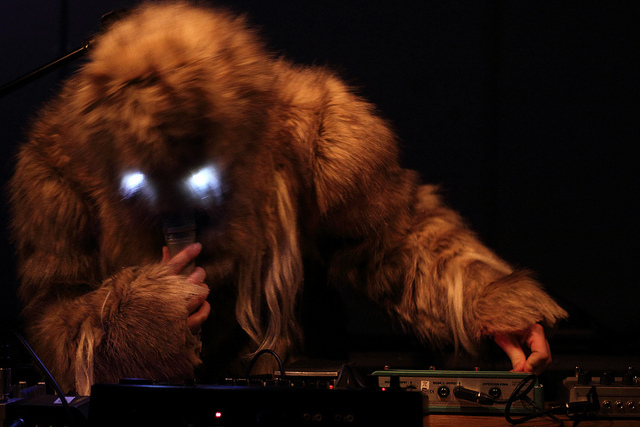 He opted to do this, as any serious experimental musician in the circumstances would, whilst dressed as a yeti. A yeti with white glowing eyes. More typically for Tucker, however, the set was excellent, his deep moans building an occult atmosphere, while he summoned ghostly apparitions of guitars and synths, this one long continuous piece becoming increasingly immersive. Yet not immersive enough for Tucker: there were a couple of complaints from him during and after the performance about the lack of volume. And while I felt sorry for him in that the set didn’t turn out exactly as he planned, it’s hard not to laugh when you see and hear a yeti whinging about his “levels”. I saw Markus Popp emerging from his sonic chrysalis in April 2009 in Amsterdam’s Bimhuis, to gingerly test out the strength of his new wings. And while the beauty of the new material was instantly apparent, he hadn’t quite perfected the performance aspect: one track simply crossfaded into the next, and he displayed all the emotion of the man from the IT department who comes round to have a look at your laptop when you’ve spilled coffee all over it (again). This Oto show was, well, rather different. For one thing, he tied the tracks together neatly with some great sections of textural bass exploration, like Eleh fragments. But the biggest revelation was his physical performance: every individual sound seemed to elicit an accompanying facial expression: lips would pucker for a “boip”, he’d grimace for a “brrrrrip”, and he’d look lovingly at a “gdooooo”. And the drum drops – and there were a lot of drum drops, far more than on O – would have him throwing his hands in the air excitedly. I’m still not sure how much of the set, other than perhaps those growling interstitials, is actually live – it all seems too intricate for him to be spinning these shapes on the fly. But with eyes closed, and without the, er visual element, these wonderful noises just seemed to dance from the Oto sound system. So light and crisp, the extreme separation turning them into tiny specks of smouldering silver foil, floating and swirling into sequences and patterns, forming lengthy new sonic events as much as they formed new events of light and colour.